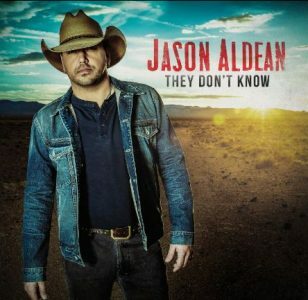 In an industry comprised of songs entrenched in sunshine, partying, and movie-ending love stories, ‘They Don’t Know’, Jason Aldean’s recent release, floats on over troubled waters. Jason Aldean is at the point of his career where anything can happen. He started small while gradually building up to what became a massively successful career. With a loaded catalogue of music, stadium tours, and a small scandal, it was expected that Aldean would either put out a record of the same magnitude as his past works or release something surprising. Though listeners are still receiving the sound of mainstream country they’re used to, ‘They Don’t Know’ sticks the dark side of a successful career into the faces (and ears) of those listening. Exactly what we don’t know is still a mystery, but with a cast of band members and songwriters – Aldean keeps everyone stimulated by teasing a vague unknown. The album gives off various lonely themes throughout its course while remaining positive. At times, it’s reversed – lively moments with sad undertones. Although the album contains catchy chord progressions, emphasized sing-along choruses, and all around quality songwriting, the lyrical material needs to improve. The problem with ‘They Don’t Know’ – along with many other country records – is its lack of topical creativity. For an artist who has put out seven albums in 11 years – fresh ideas are crucial but rare. Unfortunately, the Aldean crew could not fully leave the ‘bro-country’ demand. From a business standpoint, it’s a smart move. But from a creative perspective – it lacks. As millennial country enthusiasts grow further into adulthood, topics like tailgating, spring breaking, and alcohol consumption are bound to be regarded as immature. Thus, subtracting attachment and emotional investment from Aldean’s music. For a country record, ‘Lights Come On’ is a great opener. The strobe light percussive rhythms are prominent throughout the upbeat flowing track. As the name suggests, it’s a great way to begin a mainstream country record. The lead single from the record. This farewell ballad is a relevant track given the time of year. Aldean begs for an extension of the season in addition to the sight of a lost love. This catchy track creates an ideal setting to slide your arm around your partner at his show. The energy returns in ‘Comin’ In Hot’. Listeners get a glimpse of Aldean’s lustful side as he admits he’s eager to get physical. Though the song itself isn’t single worthy, it makes for an intense shock positioned between slow tracks. Assisted by Kelsey Balerini, Aldean puts a romantic twist on missing a former significant other. The standout and relatable line: “First time seeing you with someone new – dyin’ inside tryin’ to play it cool” encapsulates the theme for the song. A catchy track but loaded with too many familiar cliches like a girl stealing the hat off her boyfriend. It’s been recycled before but regardless, ‘Bad’ still keeps it solid on the musicianship level. Title tracks are always expected to contain a little more juice than other. ‘They Don’t Know’ turns up the punch with driving guitars and a few unique tremolo effects. This track is an anthem for hard working small town citizen. Probably the most accessible track on the album. Between the lyrics, the melodies, and overall flow ‘In Case You Don’t Remember’ keeps the latter half of the album alive with a splashy chorus and a solo vocal line to conclude the number. An interesting approach to the agony of the drinker. Downtempo in pace but energetic enough to keep the music alive. “They Don’t Know’ brings together a bundle of catchy music (both big party songs and heartbreak ballads), good songwriting, and a back and forth of emotion, but was released two years too late. Taking nothing away from the hard work that goes into creating a major production like ‘They Don’t Know’, the hope is Aldean and other country artists can master a more balanced approach of 2016 country and maturity. For tour dates and more information on Jason Aldean, visit his website.